LUSAKA- 22/02/2015 – This came to light during the induction service of the newly appointed UCZ Communication Secretary Rev Dennis Mbita Sikazwe at St Paul’s Congregation in Lusaka. Mama Chibesa Kankasa a veteran politician and a member of the UCZ was the Guest of honour. 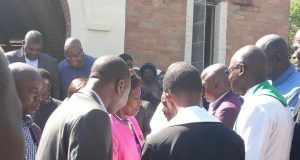 In attendance were the newly appointed Deputy Minister of Defence Honourable Mulenga and his wife, Presbytery Bishop for Lusaka Rev Rodwell Mwape Chomba, and Copperbelt Bishop Rev Sydney Sichilima and the wife. The Guest of Honour Mama Chibesa Kankasa congratulated the United Church of Zambia for successfully celebrating the Golden Jubilee marking fifty years of the church union which came into effect on 16th January 1965. the event which was hosted and celebrated in Lusaka at the National Heroes Stadium on 18th January 2015 under the theme: “celebrating 50 years of the gospel and unity” was a land mark in the history not only of the United Church of Zambia but the nation as a whole. She was further delighted to see the event whose preparations used to take place in her own house coming to pass. It was also historical because it was just coming after Zambia’s Golden Jubilee on 24th October 2014. She therefore wished the church well as it looked forward to another fifty years of fruitful mission. Mama Kankasa commended the United Church of Zambia for the immense contribution towards the development of this country through its education, health and agricultural institutions. She reiterated that communication everywhere in the world is one of the pillars of success, and she strongly believes that the responsibility that is being put on the shoulders of Rev. Sikazwe was not outside what he has been called to do as a Minister of the Word and Sacraments. He is infact pursuing the great commission at a higher level. She further argued that God himself has never underestimated the power of communication. and that one of God’s attributes is that, God is all knowing, and from time to time he bemoaned the state of his people – Israel when he consistently said, “My people perish due to lack of knowledge”(Hosea 4:6), and “where there is no vision people perish”(Prov 29:18). The worship service was graced by a Copperbelt Gospel Artist Mr. Winter Pwele of UCZ Bethsaida Congregation in Chililabobwe whose song “Lesa mwalilinga” sent the whole congregation into worship. 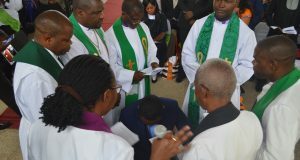 The order of worship was led by Lusaka Presbytery Bishop Rev Chomba. Also in attendance were the General Secretary of the United Church of Zambia Rev Dr Mulambya Kabonde and the husband and several UCZ heads of department. The induction service was officiated by his grace the synod bishop of the United Church of Zambia the right Rev Mutale Mulumbwa. Speaking on the importance of communication mama Chibesa Kankasa said god never left communication to the ranks of ordinary angels, but instead he appointed an archangel Gabriel to be Minister –in – Charge of information and communication. And she i totally agree with Rev Sikazwe who said, it was practically impossible to teach and disciple the whole world using the traditional pulpit as the practice has been, and that reaching out to the entire world takes more than the pulpit. The church needed to move with time and technology. She commended the church for recognizing communication as an important tool for effective mission as it accompanies the people in their daily struggles through the mass media and not just preaching to them on Sundays. The Church’s is therefore called to warn, inform, educate, engage, advocate and entertain God’s people through its communication wing on a daily basis. Rev Dennis Mbita Sikazwe was born between the late Dr Stabin Mutende Sikazwe and the late Damsel Namuziya on 3rd February 1967 in Mpulungu, Posa village. He did both his primary and secondary education in Kasama. 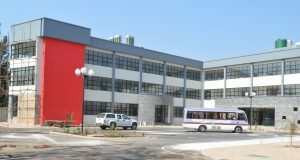 He completed his grade 12 in 1986, and entered the UCZ Theological College (now UCZ University College) in 1989, and completed his training in 1992. He has served in Northeastern (now Muchinga Presbytery) at Isoka main congregation. He got married to Priscilla Nanyangwe Sikazwe on 29th August i entered into holy matrimony with whom they have been blessed with four children – 3 boys and one girl. They are also in custody of 3 other lovely children. After a two year service at Isoka, the synod of the United Church of Zambia that sat at Kafue Boys Secondary School from 23rd to 27th August 1994 by divine permission admitted Rev Sikazwe into the holy orders of the ordained ministry of the Word and Sacraments on the 15th day of October in the year of our lord one thousand nine hundred and ninety four (1994) at Isoka Main Congregation. He was later transferred me to Mpika consistory at Tazara Congregation where i served for 3 and half years. In 1997, he went for further studies at Evelyn Hone College of Applied Arts and Commerce for a year. After which he was moved to Lubwa consistory at Chinsali Main Congregation where he only served for a year before being seconded to the United Church of Zambia Theological College (now University College) as its Head Librarian and lecturer in ministry, homiletics, missiology, pastoral care and counseling. While serving at the UCZ University College, he was also appointed Minister – in – charge of Kwacha East congregation in Kitwe from 1999 to 2002. In 2003, he again went for further studies to Cape Town. Upon completion of his study programme he was asked to serve at Mukuba congregation from 2004 to 2007. in 2010, he served at Kamfinsa Congregation for one year before going back for further studies in cape town from 2011- 2012. He also served as acting principal in 2004 from January to august. He has served at the University College for 14 years. At the beginning of 2014, Rev Sikazwe commenced his doctoral studies which he was still pursuing with the University of Fort Hare in East London, South Africa. In October 2013, god led him into yet another dimension of ministry when synod appointed him as synod communications secretary. Rev Sikazwe revealed that the United Church of Zambia had installed two community radio stations. The first one is on the Copperbelt sponsored by St Andrews congregation in Ndola. It completed its test transmission and it is now serving not only the Ndola community but the entire Copperbelt up to Mkushi district. It is scheduled to be officially opened in June this year. The second one will be based in Lusaka, sponsored by Lusaka Presbytery. The installation has since been completed and what is remaining is the allocation of the frequency before it commences test transmissions. Mr. W.G.P. Sinkala 1970 as Synod Literature Worker – who was based in Kitwe. Rev Peter Hoyle in 1971 as synod literature and broadcasting Officer – Ndola – St Andrews. Rev Dr David Curtis 1972 – 1982 as Synod Literature, Research and Broadcasting Officer – Kitwe. Rev Fammy D. Silungwe 1983 – 1995 as Director of Literature and Publications – Kitwe. Rev Evans Chibesakunda 1991 – 1992 as Communication officer – Lusaka. Rev Belington M. Kabaso 1996 – 1999 as Director of Literature and Publications – Kitwe. Mr. Moses Mbulo 2001 – 2009 as Communications Secretary – Kitwe. Mr. Wycliffe Mushipi 2012 – 2013 as Communications Secretary – Lusaka. With the support of the whole church, he pledged to do his best in establishing a strong communication framework that would outline the communication strategies, to brand the united church of Zambia in a way that would enable all people to know who the United Church of Zambia are, and why they do what they do. He finally thanked his wife Priscilla (whom she called an “earthly angel”) and the children for being there for him. The Guest preacher, the Rev Kapembwa Kondolo urged Rev Sikazwe to do his best with all humility. Rev Kondolo is the Rector of the United Church of Zambia in Kitwe, where Rev Sikazwe has worked for 14 years. Next: Bishop Thuma Hamukang’gandu Counsels UCZ Newly Ordained and Commissioned Church Workers.